High quality product! Great addition to my suspension straps. I use these on my straps to hook the whoopee slings to. Great ease of use and good security for holding the hammock up. I ordered a set of these carabiners with my hammock purchase and was surprised at the size and weight being so small & light for an 1100 lb. rating. It definitely makes the hanging of the hammock fast and easy with the webbing/buckle system. I ordered 6 of them I believe and they all are quite light and durable. I think it is worth the cost if shipping is not included. Very light weight. Nice rounded edges. I would recommend. Lightweight and strong! Love these things! Seems to be a decent carabiner. 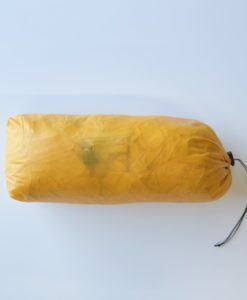 I received a set of these for free being that a purchased a tarp and hammock. Seem to do the trick for my webbing straps for my hammock. Simple, lightweight, strong, easy to use and no sharp edges or burrs. Nice, basic carabiners. A good well made carabiner at a good price. I like them enough that I am going to buy a few more. They are much lighter than I thought and at the same time resistant. These are great little caribiners. Small, strong and light! These carabiners are incredibly smooth. No sharp edges to snag on gear whatsoever. They’re light as a feather. Picking up the package, I thought maybe I got shipped 3 single carabiners instead of 3 pairs. Sleek. Solid. Affordable. 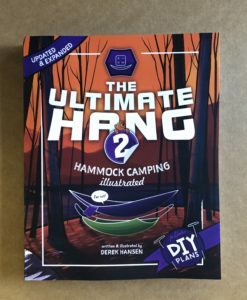 Using them for hammock camping, hanging a bear bag, and hanging a water dromedary. I have two extras from my order that I promised to a friend but they’re so nice I want to keep them all! 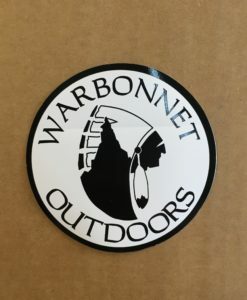 I’ll be getting more next time I place an order from warbonnet. I like how lightweight they are and the price was good. They do exactly as they are needed. Light, sturdy, cheap. Good value. Just your everyday typical carabiners. Nice that I could buy everything I needed in one place. I just got into hanging but have been a climber for years so I am a bit of a biner nerd. My biggest peeve are biners with sharp edges that can degrade gear in transit. These are good quality, load bearing, and are well finished to reduce wear or ‘pokeability’ so I don’t think twice about stuffing with line, tarps or the hammock. The best light weight heavy duty caribiners you’ll find anywhere for just a fraction of the cost you’d pay if you purchased retail. These Warbonnet ‘biners are light-weight and have a great feel. They appear well-suited for general use and for suspending the hammock. I see no structural flaws and the weight rating appears appropriate. Good value for the price! 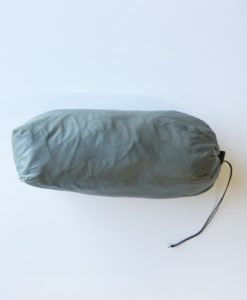 I use Warbonnet’s Carbiners with all my hammocks and have never had a problem. They easily handle any load, are light weight, and the cost can’t be beat. I use these biners to attach my tarp. I’ve been using these for several years without failure. Highly recommended my multiple purposes. After a mishap with standard carabiners one cold camping night, I began using my hefty stainless steel scuba diving bolts to secure my hammock and tarp and other backpacking gear. Scuba bolts are heavy, but I wanted to stay off the ground. 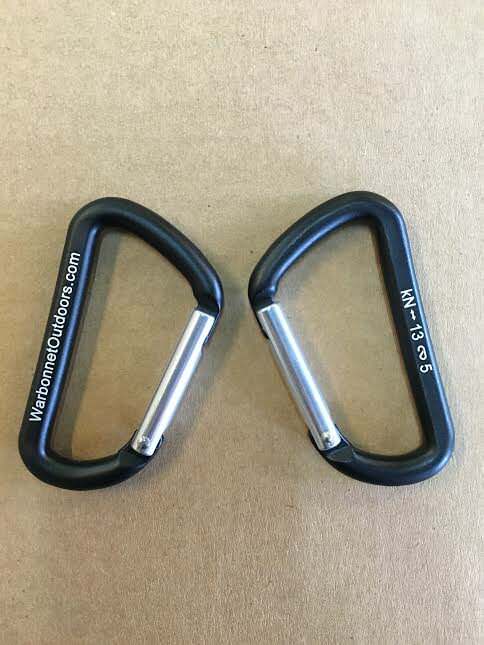 I really wanted to lighten my pack, so I ordered these carabiners from Warbonnet. Even after reading the reviews, I didn’t believe such a light carabiner would withstand any significant weight, especially in a storm. I emailed WB to verify….I don’t think they were too impressed with my inquiry….lol. So, I decided to ditch all my scuba bolts and commit to the WB carabiners on my recent AT trip. Sure enough, a raging storm came in, and these carabiners stayed secure all night keeping me off the wet muddy ground, snug, warm, and dry in my WB Blackbird hammock and 4 season tarp. Okay, so I’m a believer now. These carabiners are one of the best gear purchases I’ve made. I made believers out of fellow campers on the trip too. Now, I just wish WB made ponchos out of their tarp material. Hint, Hint. I love these carabiners. Easy to use, lightweight, work perfect with my hammock. Good Price and Great Product to grab with the purchase of your hammock or tarp. They are incredibly light and well made. Great bang for the buck. Good product. Light and work great. Strong yet lightweight, says it all, many uses, replaced my heavy caribiners with these. Quality, quality, quality at a small size and ultra-lite weight. I have three pair. When I first saw how light these carabiners were, I doubted I would use them, but decided to give them a try. I always carry climbing carabiners, which are super heavy compared to these. After using them for 3 nights, I will re-purpose my climbing carabiners, because these are super strong. I didn’t think something so light-weight could do the job, but they certainly do. Love them, and will buy more for other purposes. I really like the tooth lock style gate on these. They seem to be of very high quality and very light. These are well built and affordable. I would have no hesitation taking these to their rated weight limits.